The No Gi program is an adaptive Jujitsu program designed for tweens / teens that benefit from more individualized and self-paced instruction. All classes are open to the general public. Individual and group exercise, completing curriculum tasks (mitt holding, striking, stance work), promotion of positive “never give up attitude”. The "No Gi" program will exact drills during each class which enhance a participant’s physical and mental strength. We believe that each of our students can learn about themselves through attempting the training sets that we utilize and achieve some measure of personal growth. There will be physical, focus, team and awareness drills during each class. This program will provide a safe place to meet new friends with structure built in that will assist in creating positive interactions. Additionally, there will be a component of teaching situational social interactions and our instructors will model / guide the participants through these drills. Ultimately, as each given group of classmates becomes familiar with each other, camaraderie among them will increase and a team atmosphere will emerge. This program will excite and challenge each of the participants that choose to attend. The instructors draw out as much energy and focus as any student can bring during a given class. As students become familiar with the drills, as they begin to learn the expectations of the instructors and as they become familiar with their teammates, confidence will breed. What we have noticed from experiences in the "Jujitsu Buddies" program is that our students begin to take the confidence that they gain during class out into the world with them. We are excited to share this with the kids in the "No Gi" program and we anticipate similar results. Large and small group activities; learning each role in a given drill and understanding the importance of each task. No Gi Jujitsu is an ongoing program that is offered throughout the year and is uniquely designed to include students who may start at any time without them feeling behind the rest of the class. * No Gi Jujitsu is eligible for family cash reimbursement to those who participate in that program. Mike Palmer is an accomplished martial artist who holds Instructor ranks in multiple art forms including Jujitsu (2nd degree) and Karate (2nd degree). Mike has also advanced knowledge of Boxing, Muay Thai, Judo and Wrestling. Mike’s 16 years of experience has given him an extremely comprehensive view of the entire martial arts picture. All of the previous experience listed provided Mike the knowledge and confidence to develop his own art form (Strike Back Martial Arts). In Mike’s (day-time) professional career, he has worked in the Human Service field at EPI for over 10 years. EPI serves the Autism population as well as other developmentally disabled individuals. Mike has provided years of direct support with participants in his programs at EPI and has also managed several programs that assist in skill building such as advocacy, empowerment, attaining personal goals and independence. All of this experience has given Mike an expertise with the ASD/ DD population. Mike currently holds the title “Community Services Supervisor” and manages a Certified Day Program Facility as well as a Community Habilitation Program. Over the course of Mike’s tenure providing direct care service and managing programs, Mike has attended multiple trainings on ASD and many other DD diagnoses. Mike has accumulated an extremely diverse set of skills through constant strategy trainings, personal interactions and the general study of this population. Over the past few years Mike has merged both sets of skills that he possesses and specifically sought out opportunities to teach children with ASD. The results have been extremely positive and the benefits from the training have been apparent. Throughout the time spent teaching individuals in the ASD population, Mike compiled information from each class (strategies that worked, strategies that did not work, communication styles, cueing, curriculum pacing, etc.). This compilation of data became the framework for “Jujitsu Buddies”. Ultimately, Mike has a very passionate view on helping people attain their goals and does not believe in the misconception that “people with disabilities can’t”. Mike believes very strongly that the benefits of martial arts training to children with ASD are nearly limitless. Dave Nicchitta has been involved in martial arts since 1999 and holds instructor ranks in Jujitsu (2nd degree) and Functional Self-Protection / Combative Self-Defense. Dave has studied and has extensive knowledge in other areas as well such as wrestling, boxing, Muay Thai and Risk Assessment. Dave’s experience, knowledge and desire to help others led him to establishing and opening Strike Back Martial Arts in Webster, where he and fellow owner, Mike Palmer have developed their own training system. Dave has worked for over 10 years as a member of the Monroe County Sheriff’s Office Road Patrol and recently was assigned to the Property & Evidence Unit. Dave has gained invaluable experience dealing with people of all ages in a multitude of situations. Being able to think on his feet and adapt to situations as they change has made Dave successful and respected in his job. Dave has volunteered in organizations such as Special Olympics, The School of the Holy Childhood and UNYFEAT (now AutismUP). Dave’s experience with ASD and those who have it became very personal for him and his wife when in the summer of 2011 their son, Christopher, age 4, received an Autism spectrum diagnosis. Like other parents whose children are newly diagnosed, it made Dave want to educate himself about ASD to help with his job as a parent and advocate for his son. This new perspective also helped Dave in his role as a police officer when dealing with individuals in the community. In an attempt to bring martial arts into Christopher’s life, as Dave had done with his daughter, Dave enrolled Christopher in a karate program. This program was not a good fit for him. It wasn’t until recently that Dave’s son expressed an interest in “going to class” like his sister. Christopher was introduced to “Sensei Palmer” and started attending the Junior Jujitsu program regularly. Mike’s ability to communicate with Christopher and make him feel comfortable has given Christopher the confidence to do things he previously may not have done. You can see the positive results: it is evident in the pride Christopher has in himself when he accomplishes something new in class. 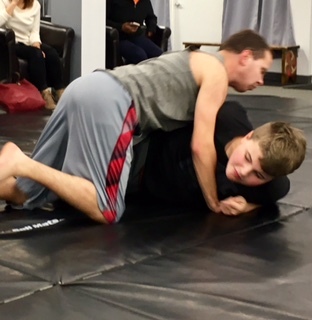 Exposing martial arts to someone with ASD and seeing the benefits that occur from that experience firsthand made Dave want to offer a martial arts program to other kids with ASD who may benefit too but have nowhere to go.